Data from 16,000 completions of the VinciWorks Phishing Challenge shows that 15% of users are at high risk of falling for a phishing scam. That risk level dropped to 5% for users who completed at least two challenges. VinciWorks has released Phishing Challenge 3.0 with a brand new set of emails to reinforce phishing education. In this simulation, users are presented with a series of suspicious emails and must identify red flags. All phishing challenges are included in the purchase of the cyber security training suite or the OCC suite. We recommend that you deploy a phishing challenge at least once a year. 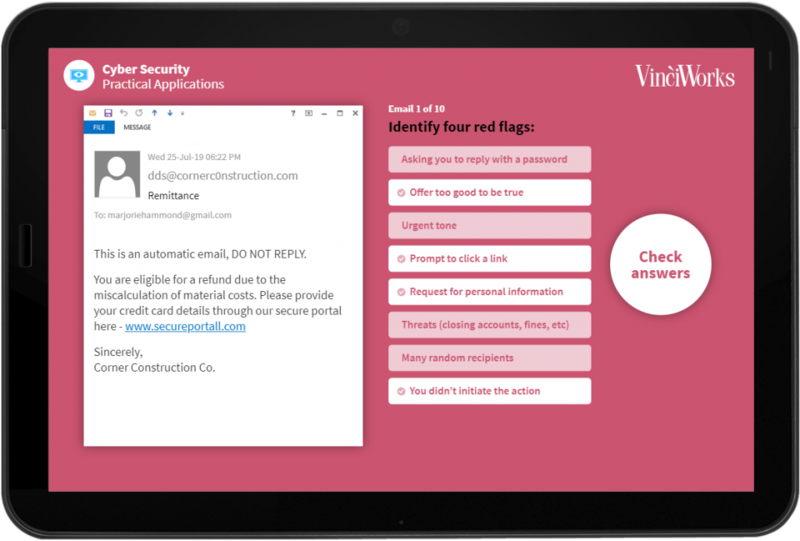 With VinciWorks’ expanding cyber security suite, there are now three phishing challenges to choose from. The Phishing Challenge can be customised to include IT contact information, as well as information about internal cyber security policies. In addition, Phishing 3.0 can be translated into multiple languages and the emails can be fully customised and adapted. You can start customising the course here. Later this year, VinciWorks will be expanding its cyber security suite with new courses to help businesses tackle the latest cyber security threats. The suite will focus on the human aspect of cyber attacks, in recognition of the fact that staff are often the weakest link in cyber attacks. To learn more about the training, complete the short from below and a member of our team will contact you. This entry was posted in Course & product updates, Thought leadership on 15th April 2019 by VinciWorks.